Nothing helps the review process unless there is some vested interest in the apps youíre about to roundup. In this instance Iíve just been invited for a weekend away in Scotland and as the train is about to cost me £158 and driving would take the best part of 11 hours the only option I have is to look is flying. 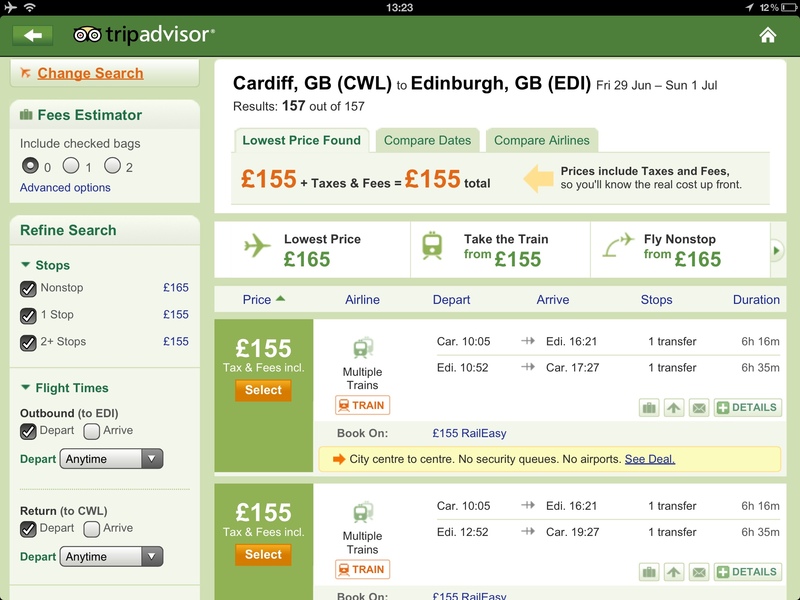 So here is a small roundup of applications to compare flight prices. 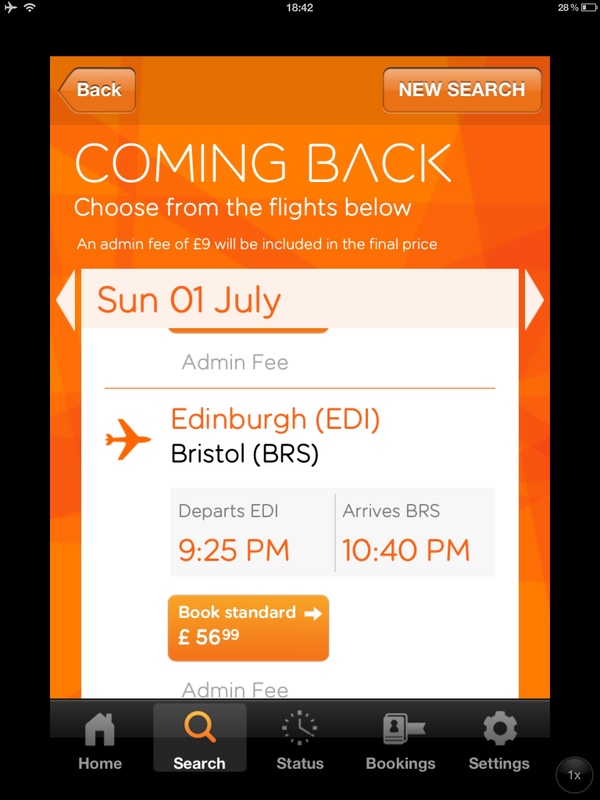 I’ll be testing applications that work both on the iPad and the iPhone To try and find the most cost-effective flights from my local airport to Scotland. Searching supports airport abbreviations so if you know the 3 or 4 digit code associated with your airport you can enter them instead of the full airport name. Other filters are available like setting the outbound all return departure times. On the iPad buttons and functions have been clearly designed and take full advantage of the iPad display. For those who are using it, they might notice that how metro-esque app looks and feels, not that’s a bad thing here. If you’ve used a Windows 8 mobile phone you’ll know exactly what I mean. Once again airport abbreviations are accepted and just like skyscanner when it comes to making your booking you are booted out from the application and taken to the agent’s website. Initially trip advisor annoyed me a little. Before I’d even got to anything useful it was trying to get me to signing with Facebook instead of letting me get on with things. If I’d wanted to broadcast the fact I’m going on holiday so that anyone untoward could come in break into my house, I do that myself thank you. Although this one is clearly aimed more at the on the road travellers as it’s the 1st application to actually use my location to find the nearest airport so it does redeem itself a little bit. And again it clearly shows you searching for flights yet the results which are pulled back tried to shove me on a train first rather than offering me the flights. I’ve mixed feelings about this as I can see the point of a general travel search. Ok so it’s good to know my alternatives but I’d have preferred an overall search which presents the hybrid results and then a dedicated flight search. Not sure if that would work but I’m sure I’m not the only one to be stranded somewhere thanks to airports, weather, ash clouds etc. 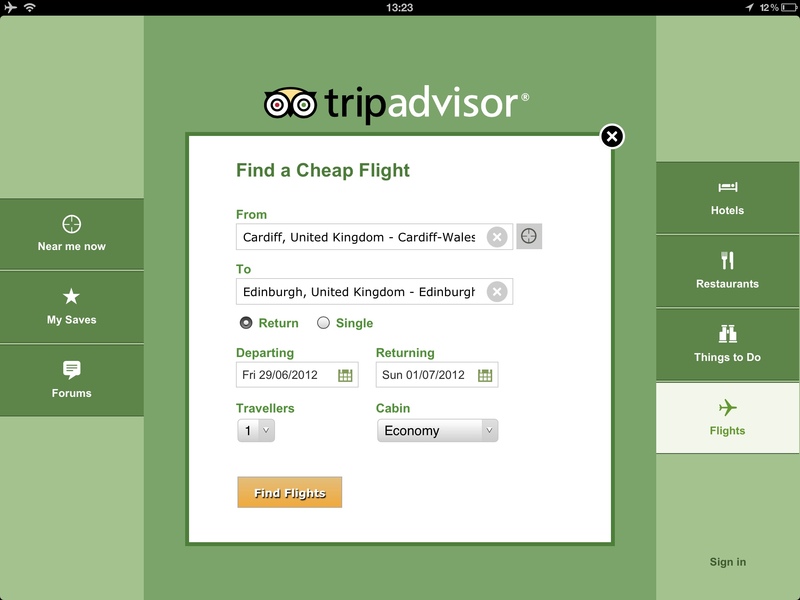 Playing with Trip Advisor you feel it’s less of a proper application but more of an app displaying webpages. Knowing that I had already decided on taking the playing and selecting flight option in trip advisor and I was surprised to see that initially they were offering me multiple train-based routes instead of flight information. I can see how this would be handy. 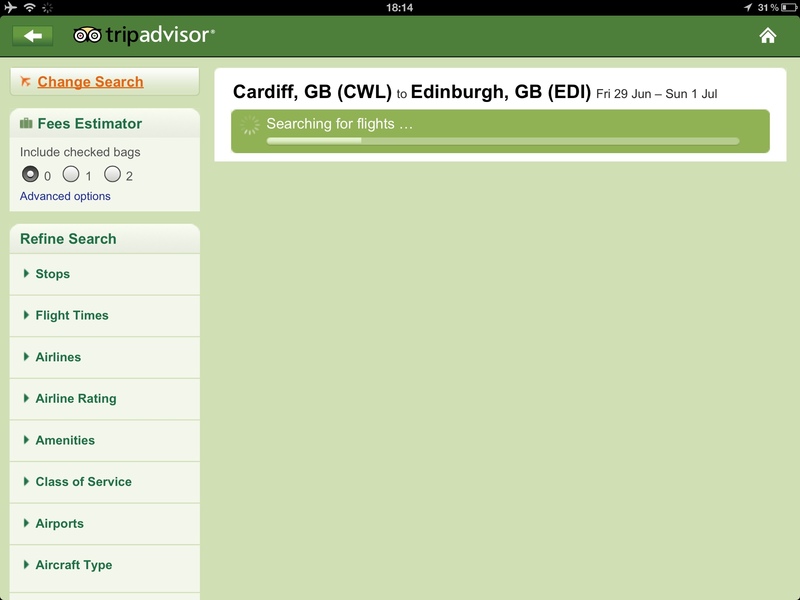 TripAdvisor Hotels Flights is available from the App store. 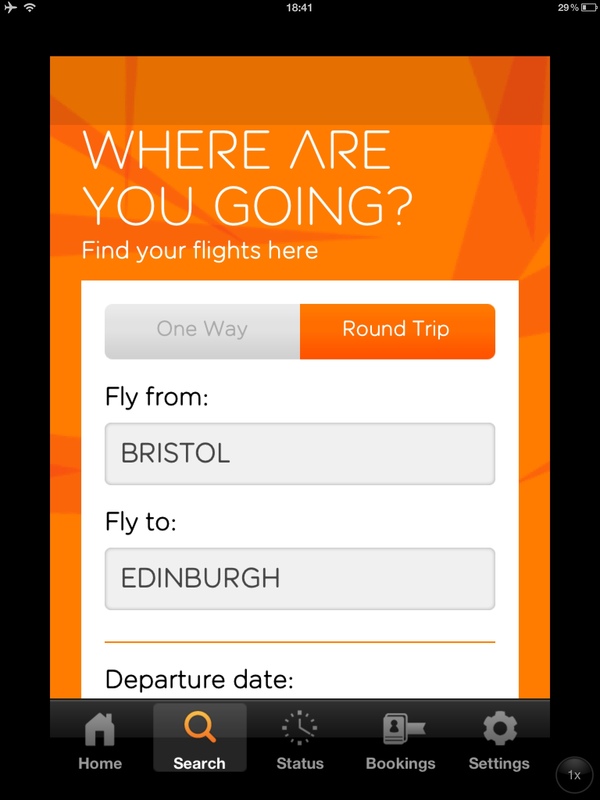 The EasyJet app drops you straight into a scroll wheel selection which isn’t that bad as they do only cover a limited amount of departures and destinations. 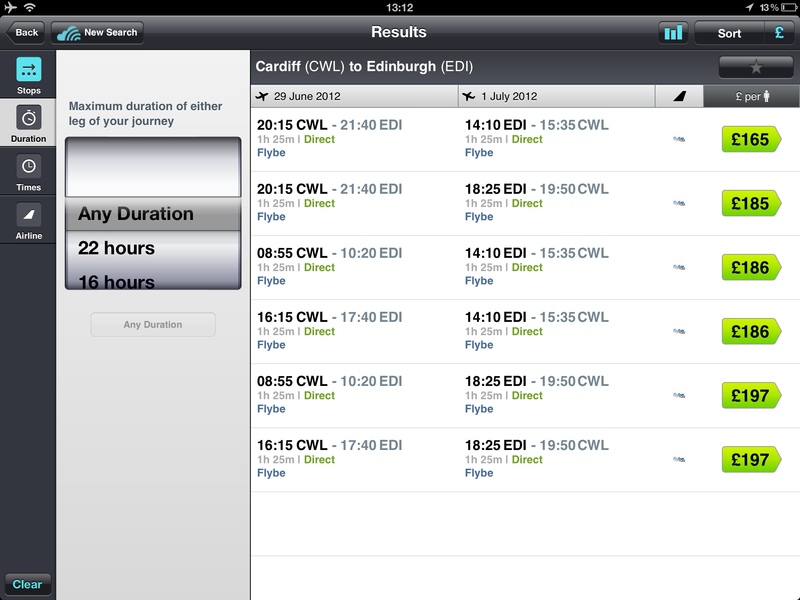 Again the app looks very Metroesq (windows phone style) with the presentation of flight results. This works extremely well on the device sized intended for and even on the iPad it doesn’t look too shabby despite a lack of retina graphics. Just as this article was being finished I stumbled across this app by accident for the iPhone. 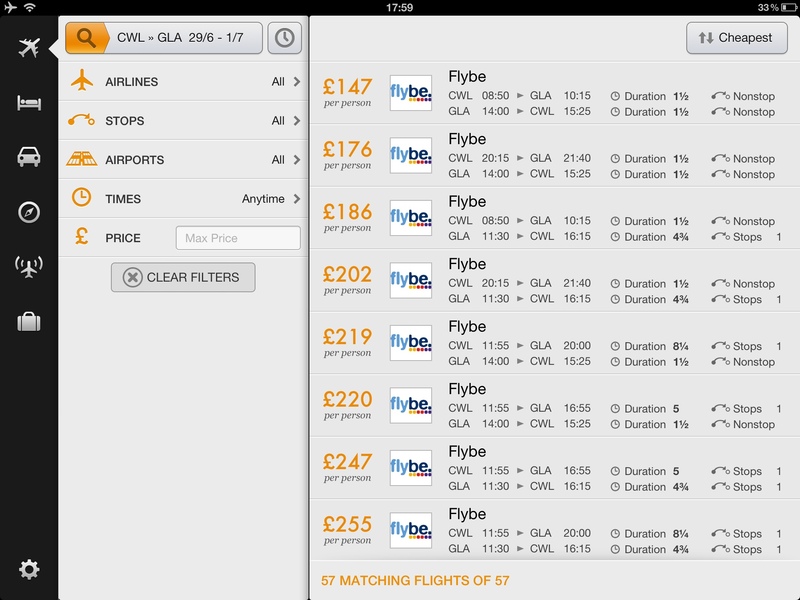 Somehow managing to be even simpler than Easyjet’s offering, Momondo does all the inputting at the front page and within a few clicks flights were being offered. Originally I’d started out on this review to see if I could save some money on my flights using my iPad or iPhone yet it soon became apparent that most of the apps pull the data from the same sources. If you’re looking to save money on your flights then check out my hints and tips below. There isn’t really one application that stands head and shoulders above the others meaning it all comes down to personal preference. Annoyingly there are some applications which aren’t available to the UK market which provide a much better job and will let you book flights for the UK just in USD. So if you’re the clever type and know your exchange rates you can save a few pounds that way as well. 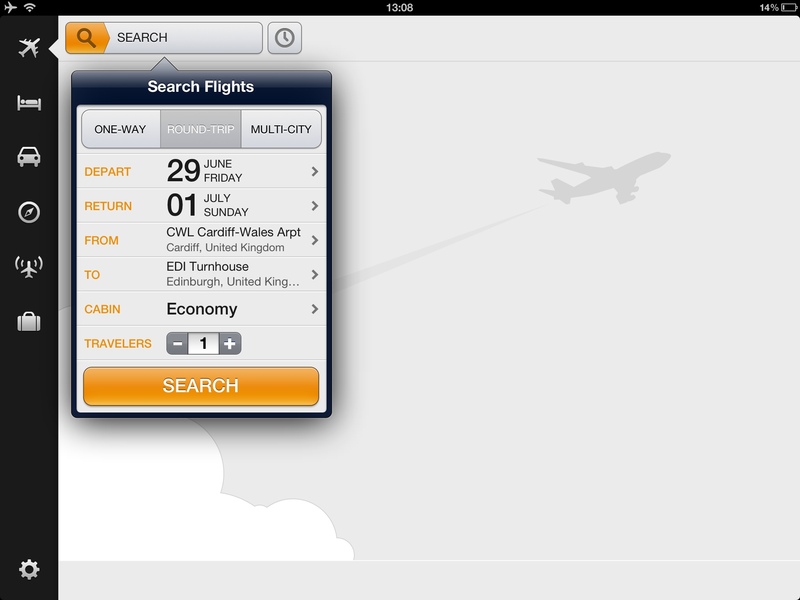 Take a look at Hipmunk.com for a refreshing take on airline travel searching. 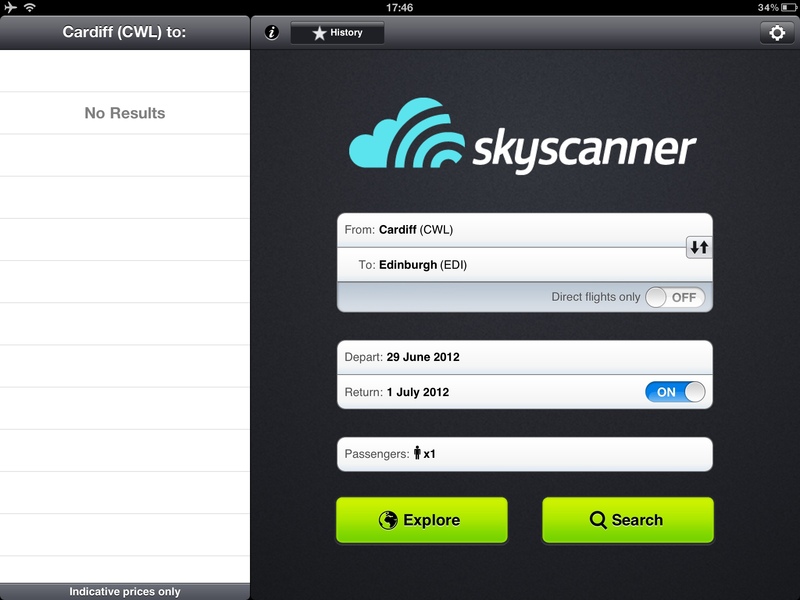 If you do book online with your iOS device don’t rely entirely on all the information being on your iPad. Both iPhone and iPad screens have problems being scanned by barcode scanners so keep a print out on you just in case. It might be a pain to try and print from Apple devices but it’s good to have a backup plan. We all know what airlines can be like.